Many of you remember that I removed all my ribbon off of spools and rolled it onto matboard bobbins so that I could decrease the huge storage space that rolls command. (Check out this post to see what I mean. ) Well as I re-rolled the ribbon, I had many empty spools left over and the thought of throwing them away simply killed me. For months they have perched in the corner of my craft room in a bag. 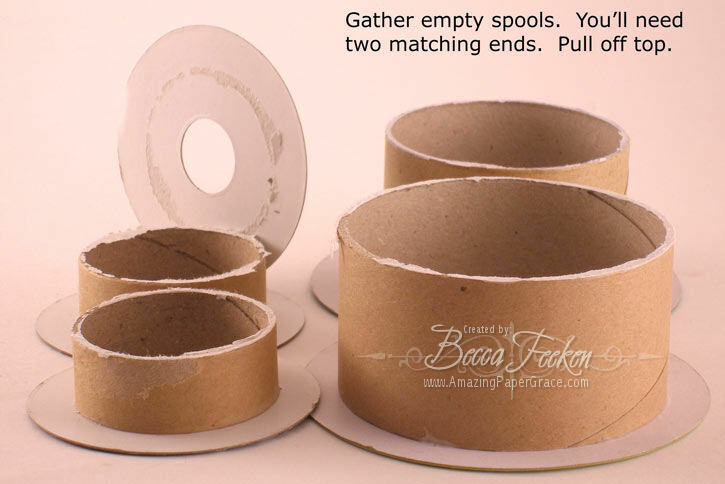 After thinking on what I could do with the leftover spools, I settled on this quick and easy idea. With the help of some paper to cover and some transparency, I have and instant gift or goodie treatment. 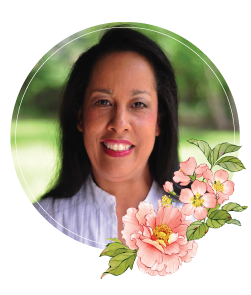 I used one of the newly released sentiments from Our Daily Bread Designs – Joy to the World, along with one of the tags from the Spellbinders Tags 5 set to personalize the gift. ETA: On the blue gift holder I hung whimsical snowflakes using the Spellbinders Snowflake Wonder set, one of my seasonal favorites, you will see this one a lot. 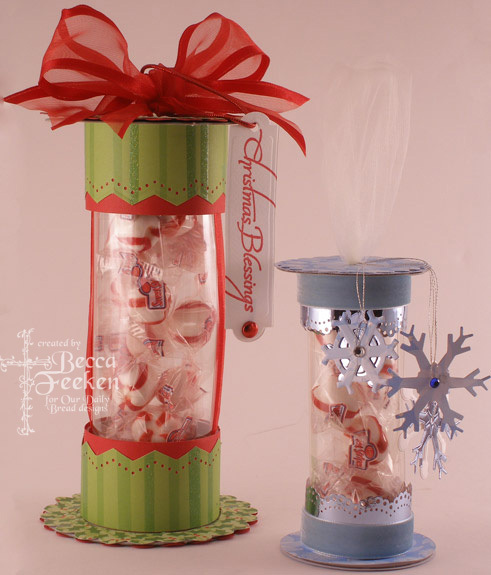 Assemble by adding top and adorning with ribbon. On the red goodie holder I cut slits on the top and bottom and threaded ribbon through. This will secure the top. My slits went on the inside of the ring but they would work on the outside as well. On the blue goodie holder I added glue dots to hold the top on. Have fun with this!! Awesome Becca!! These are gorgeous! I just love to see things get re-used and recycled like this!! I actually will buy one brand over another at the grocery store because it has packaging I can use for a craft!! Drives dh crazy!!!! How cool are those! You have the greatest imagination! If I had 1/16th of your talent…. Thanks so much Becca. 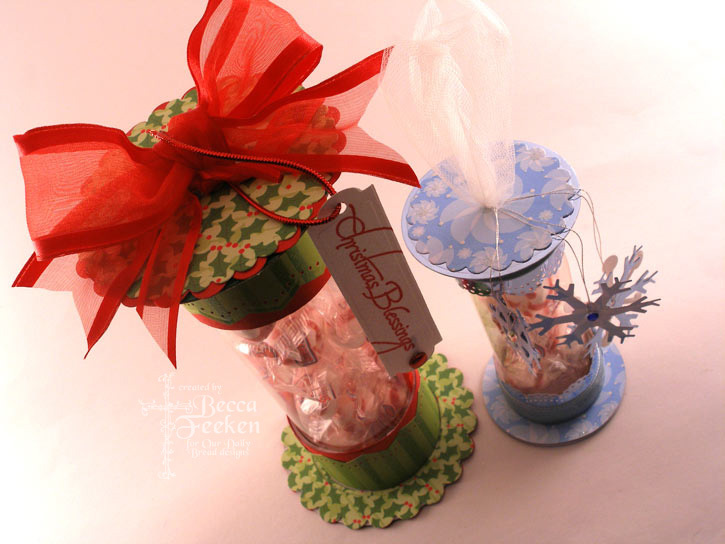 I think that I would like to do these, they are perfect for Christmas. Becca: This is absolute G_E_N_I_U_S!!! I have a whole bag of those things, waiting for inspiration. Can’t wait to try this. Thank you so much for sharing your art with all of us. Wow! Just when I think that you can’t get anymore creative, you do. 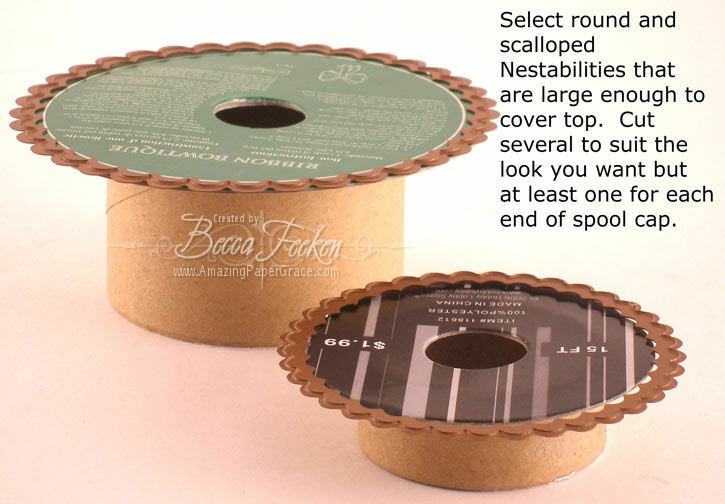 I never would have thought of this, and I have already thrown away a bunch of ribbon spools. This is great, you made something pretty, and saved some space in a land fill. I will have to try this when I finish transfering my ribbon off of their spools. What a FABULOUS idea! I can think of all sorts of wonderful things to put in these! Thanks for sharing – your creativity is awe-inspiring! Wow – You are AWESOME! I just love this project. Thanks for all of the inspiration. YOU ROCK! Becca you never ever cease to amaze me!!!!!!!! I also have been saving up empty spools hoping that I would run across a project to use them. Thank you, thank you for this great project and wonderful tutorial I am blown away. I really love this idea. Beautiful ! Love, love, love that you reuse and recycle! I love to find new uses for things too – thanks for the inspiration, Becca! What a lovely idea and how beautifully you’ve done it. hey i might can even do this thanks for sharing such a wonderful idea!! I have made little containers out of these parts, as well. It’s fun to re-purpose things, isn’t it? Hi Becca – I love this spool idea – I’m going to case it for our Sunday School class’ Christmas project for their parents. I’ll send you a pic of ours when they’re done. They really are cute. If you really want to recycle, instead of using transparancies, how about taking a 2 or 3 liter soda bottle, cutting the top and bottom off and use the center part . 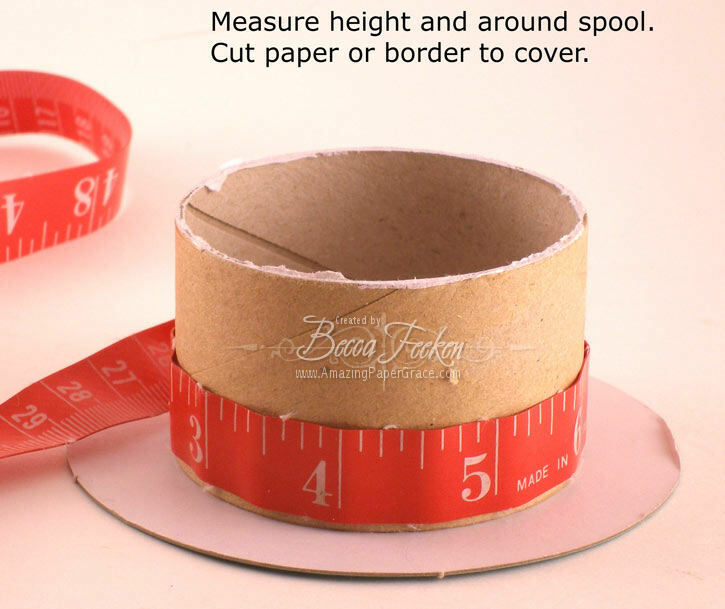 Cut length wise and measure for the size of your ribbon rolls.